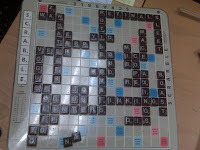 I really am playing the best Scrabble of my life right now. (Okay, I've only been playing tournament Scrabble for 18 months, so that's not really that impressive a statement, but whatever.) I went 3-1 at the club tonight. I took pictures of my boards because, well I was feeling really good about today. I decided to try out my Tom Brady jersey to see if it would fare as well as my personalized jersey (which I washed and packed for Saratoga!) My first game was against Dulcet, who used to be in the core Scrabble crew until it fell apart, but I don't think she's really been studying or anything, so I settled in for an easy win. Yah. Fat chance. She opened with a freaking bingo on me: DEMENTIA! Arggh. I played quip for some nice, she came back with hue hitting the triple to make equip. I HATE THAT DAMN WORD!!!! Okay, focus Dawn. I bingoed with destain right about the triple line, she hits me with ZAP for TWS. Waaaa. Then she bingoed AGAIN (with the second blank...the freaking tile rack) But I never gave up...and actually, I never felt like I was going to lose. I kept hitting strong four letter plays for solid scorage, including my favorite play of the game: There was a double word square surrounded on three sides by e I had the ex and was desperately trying to figure out how to stick it in there for the ex going double two ways and then I cam eup with EXEC! My next game was with the guy I hurt real bad by bingoing out with osteoma. He had come back from a close win against one of the strongest players in our division, but he was telling me that he had missed a ess hook on creaming. I also told him I would have missed that too. So in our game when I played "coping" to get rid of some crap tiles and close down the board a bit because I had bingoed and I was ahead, I was so hoping he'd miss "scoping." Sure enough he played "raisers" hooking the ess onto lo making los/raisers I insta challenged. Then he tried to hook an ess onto ava -- Challange again. This time Joel gave him a look and he said "stop that, you're getting me in trouble!" I laughed. And then won by 197. 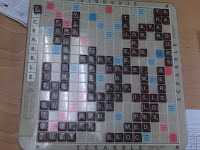 My third game was against Nicki, the first person I ever played at Scrabble club. She's very nice, but also very competitive. I have come close to beating her many many many times, but she always finds a way to win. Mostly by playing phonies on me that are too plausible for me to challenge (i.e. vyse) But my last game against her, I was making really good challenges and playing well until I "pulled a Dawn" and left my ex hanging next to the TWS. D'oh. I decided I was going to beat her. She bingoed on her second turn with linking. I bingoed right back with linters, which she almost challenged. Then she hooks an ess on linking to make boast/linkings. I insta challenged. I spent a cross country flight to Utah memorizing all the ing words that take esses. Linking, not one. Now, at the club, Joel is God. We don't have a computer for challenges, just his word. So he comes over, I show him the play and he says "it's good." I lose a turn. I am mad at myself for evidently learning my list wrong AND now falling behind by a bingo. She then plays "axings" for 44 points, but I can't challenge it cause...well, it's self evident. I bingo a couple of turns later with "whatever," an AWESOME find, if I may say so myself. Oh, look at that. I just did! We are playing closed board Scrabble, I am ahead by maybe 20 and I decide to open the board waaay up: rutile hitting the top TWS opening up five new bingo lanes. My last tile was an ess, but it wouldn't fit. 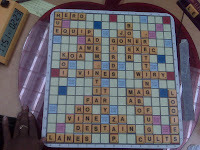 She doesn't use it AND the Scrabble gods reward me with tenail. I have to play through a letter, so I choose the ar. I can't remember what nastier plus ell is, so I sit there and write out all the satine plus ell words and see if I can do "re something." Nope. I then write out al the retina plus ell words and see if that take esses: BINGO! rETINALS. She challenges! I win by 85. Guess who else is 3-0? Barbara freaking Epstein. She takes my card from me and goes "oh, you're 1170 now, so I'm only just a little bit better than you. I'm 1202. Oh, you have a big spread. blah blah blah." Her voice really is just the worst. Anyway, I get off to fast start against her with "stander" I am leading the whole way and she is talking to herself and whining about tiles. I've got this. And then she says "exchange two," hits my clock, throws in two tiles and takes two new ones. I check the bag an dnotice there are only 6 tiles left. I call Joel and explain that Barbara exchanged when she wasn't allowed to anymore. Penalty? I get to turn over four of her tiles PLUS see all the tiles left in the bag and give her any four out of the combination of all the tiles left. I give her qbga. I was feeling pretty good until she played "qis for 38 points to take a pretty sizeable lead with only four tiles to play. And I just couldn't catch up. I lost by 14. (No picture, I was mad.) And took second place in the intermediate division. On the way home, I was stuck in horrid traffic, so I pulled up my ing list and LO AND BEHOLD: LINKINGS IS NOT GOOD! I was right. Joel was wrong. I wonder if the great Joel tripped up because LINKING takes ess as a front hook. Does the club not allow dictionaries on premises? I would have thought that someone would bring the TWL word-list book. So my intended first comment was right, Joel is a douche. Hey, fellow scrabbler here. I don't know what else you had on your rack besides TINES (that was your first play, right?) a better move would be to Exch. 2, depending on your letters, maybe even exch 1. Odds are good (55%+?) you will draw tiles to make a bingo. That does not guarantee you will recognize it, of course, only that the possibility exists. Of course, in this case your opp. probably would have bingoed* anywho* with ADEIMT?, but then you have better than 50% chance of bingoing* back. Not to harsh on your blogspot vibe, but there are a great number of LiveJournals by scrabblers (I saw you know of at least one already). Many of them have the games actually posted. Of course you can see those on cross-tables.com too.